It is no surprise that Creative Commons is at the heart of this one as they have been working with educators for years to locate and share educational resources. They have even partnered with MIT* to provide OpenCourseWare under a CC license and have been doing so for seven years. The “common metadata schema” mentioned by Casserly is already being applied to a re-visioning project that the HS library is undertaking, by the way. Our librarian is enhancing her collection’s MARC records with content “tags” for better keyword/category search results. Common search terms are often not enough to pull up high quality, educationally relevant materials and metadata can provide excellent results when one cannot see the forest for the trees. 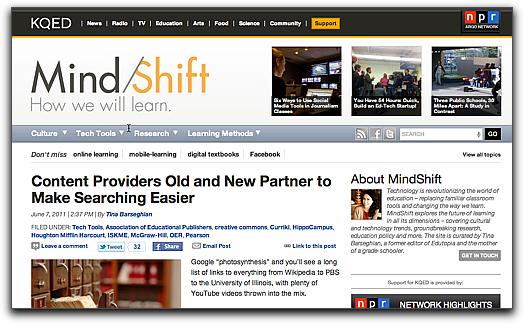 * Yes, the same MIT that provides us with Scratch, which has its own built-in CC license!